Heavy regulation from the Australian government or self-regulation? Can ISEAA help? But, what is ISEAA to start with? Talk to agencies in Australia and they will tell you: they're concerned. So far the international education recruitment in Australia has been in the hands of agencies with "no" government oversight. But the Australian government has no plans to keep that way. Well, that's not new Raphael, you may say. You're right, it's not new, the Australian government feels uncomfortable for quite some time now in relation to agents. But is it now different? There are some indications that yes, now it's different. The main indication is that for the first time the government will be releasing agents' performance data, as we discussed in our other article Australian education agencies, your performance is going public soon, are you ready? (and the follow-up The new proposed regulation for education agencies in Australia (Feb 2019)) But let's analyse the facts. In 2015 the well recognized and influential magazine Australian Financial Review (the Financial Times of this side of the world) published a story about agents. The light on agents was not the most endearing. The article cites the government calling for "enhanced disclosure", accusation of "dishonest and corrupt agent behaviour" and "[..] under a shroud of mystery, with very little disclosure about commissions and recruitment methods.". The description of agents above was not necessarily from AFR, but from a report from the government's Productivity Commission. Since 2015, the Australian government is showing discontent with the current way agents operate. And the discontent may have only grew in the last three years. More regulation has been put in place, mainly on education providers, aiming to regulate the industry and the agents by proxy. But as far as the sentiment in the industry and in the government goes, the situation hasn't improved enough. Fast forward to 2018, and now is SBS. The report is about Quack Study, and agency which - allegedly - the director misappropriated students' funds. How so - you may ask? Well, in Australia, the majority of students of ELICOS (English) and VET (technical education) are incentivised to pay at the agent, not the college. The obvious benefits of increased cash-flow, higher levels of engagement with students and net deduction of commission (due to long delays on receiving commission from colleges) are the main factors driving this behaviour. Talk to someone outside the Australia about the way agents receive tuition fees from students and you will get an immediate state of confusion, terror and disbelief. While it's not the purpose of this article to discuss the ethical, operational and other aspects of agencies receiving money from students, we can't deny, it's fairly unique. In the AFR report above, it says 53% of students are enrolling via agents in a A$17B industry. Let's update those numbers, revised projections show international education industry is now A$28B. It's almost double the size of 2015. More than A$11B added to the industry in little more than 3 years. The industry is growing and the government is aware of that. The majority of the students in Australia came via agents, as a matter of fact 73.6% of students came via agents. Going as high as 85.1% on ELICOS. There are more than 7.5K agents across the globe sending thousands of students per year to Australia alone, most of them based off-shore. 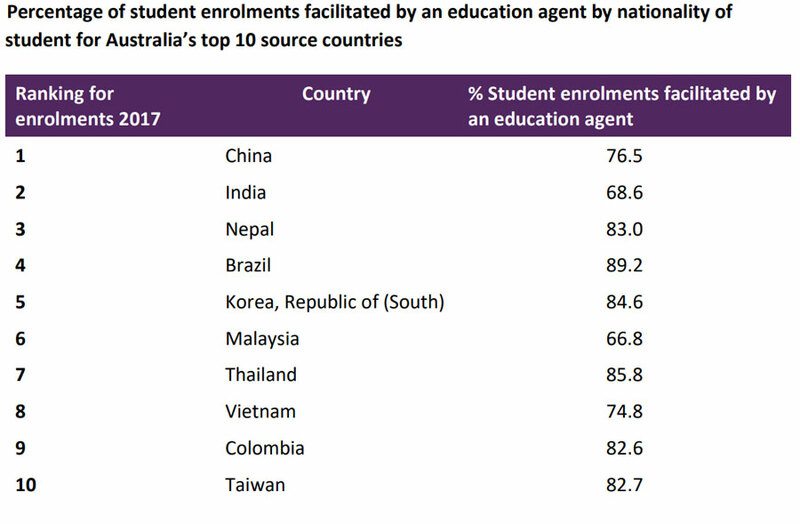 So how does the Australian government can reconcile the growing importance of international education, the highest usage of agents in the world and "lack" of regulation over them? How do you regulate companies that sometimes are not even physically present in Australia? And how do you do that without destroying the whole industry? After years of complaints of fraud, the Federal Parliament started a national inquiry into the international education industry in Australia. The focus of the inquiry was migration agents and student agencies. "What we have found out there is a lot of concerns when it comes from mainly what we called unregistered immigration agents, taking advantage of Australians, and also foreigners, could be international students trying to come to the country,” Jason Wood, Joint Standing Committee on Migration chair told SBS Spanish. Education agents are now in the spotlight. ISEAA stands for International Student Education Agents Association. To anyone in the industry is pretty clear that education agents have no official association, voice or lobbying group. There are thousands of agents, but no association, group, community with unified voice to defend and act on behalf of the agencies. The reason is unclear, but if you would ask me, I would say it's due to the fact that so far the perception of the majority of agents was: an association is not needed. Furthermore, if we add the fact that there are thousands of small education agencies in a very fragmented market, no association managed to succeed. Launched officially at Sympled 2018 in Brisbane, ISEAA is the response of the industry against the repeated and increasing concern of the government in relation to education agencies in Australia. ISEAA founding members seen above at UOW, from left to the right: Hugo Bezerra (GoodDay Education), Unknow (STB), Veronica Verissimo (360 Degrees), Mauricio Pucci (Information Planet), Regina da Silva (ABC Australia), Rafael Jacobsen (Hello Australia), Lucas da Silva (TripStudy). The official ISEAA goal is "to establish a benchmark for quality standards in the international education market. Uniting all agencies under one quality brand to support the industry. ", taken directly from their website. Born from the formerly ABEA (Association of Brazilian Education Agencies), ISEAA was initially just for Brazilians. The founding members are all from Brazil. With the participation of some of the biggest and most influential brazilian agencies - such as Information Planet, West1, Hello Australia - the association of agencies were focused only in the Brazilian market, but not anymore. Robert Parsonson is a staple amongst the international education industry, and he has joined ISEAA. Involved in multiple consultancy projects and present in the industry for more than 15 years, Robert is a trustworthy and respected figure in the community. For ISEAA to become the association which speaks for the whole education agent community one thing needed to change: different nationalities. With the help of Robert, ISEAA raised funds with the Australian government (Study NSW), diversified their board of directors, and started on boarding members from other nationalities, such as: Czechia (AustraliaOnline), Colombia (Mate Education) and Italy (GoStudy). "ISEAA is focussing on the Australian based/focussed agencies - there is now a large percentage of onshore enrolments. ISEAA is doing what it can to advocate for building the engagement with government, peak bodies and providers and build more self regulation and transparency before it is imposed. " Robert says in a LinkedIn post. So far the Australian government never asked the education agencies before making decisions; understandable, as there was no single official body to talk to. ISEAA has already been assisting the government with clarifications, definitions and discussions. It seems to be helping to shed some light on what the education agencies really are - a concept that may be difficult for Canberra to truly understand. It's only possible to help the Australian government understand agencies if they can talk and trust in one single "official" representation body. Imagine you as the government: more than 7.5K agencies, to whom you start talking first? It seems all good them, right? Agencies will finally have a voice in the decision making. Well... we still have to wait and see. It's only possible to represent an entire industry, if the industry is supporting the ones trying to represent them. So far the fragmentation and multiple attempts of creating an association in the past may turn a lot agencies in skeptics. It's not the first time an association was born to represent agencies. There are multiple associations for education providers and even association of agencies in other countries, but in Australia it never managed to get traction. The problems were varied and too complex to discuss in this article. What remains to be seen is if ISEAA will manage to overcome where others failed. The prognostic is good, no other association seem to have such a solid foundation (funding, agencies and people), but in a market with thousands of small agencies, is it realistic to think an association can represent everyone? It's undeniable that every nationality/market operates differently. LATAM is different than Europe, which is different than south east asia, and so on. Can an association represent different and sometimes conflicting interests for the long term? There are too many contentious points across different markets that can paralyse the decision making process at ISEAA or prevent agencies to become a member. Can the perceived greater good of the international education industry in Australia get everyone together to support the association even at its infancy? Applicants must submit the details page and the agreement page of each contract. Potential Member must agree to their Terms & conditions, Code of Ethics and Code of Conduct. Not all agencies have agreements with Higher Education institutions, as those can be notoriously difficult to have. What if an agency does not work with ELICOS or VET? How the majority of agencies will react remain to be seen. Not everyone will join and association having no voting power just for the sake of making the industry better or preventing potentially disruptive regulation from the Australian government. Opinion: maybe that should be enough reason to join ISEAA? Regulation may disrupt the industry in ways that could be literally unsustainable for a lot of agencies. While the benefits will most certainly increase, are the current benefits enough to motive agencies to become a member? I tried to have an unbiased and fair representation of ISEAA. Our opinion is that more than ever, some kind of formal organization from agencies is required. The Australian government is cracking down on the industry and if the interest of agencies is not defended against an increasing disposition of heavy regulation from the Australian government, the consequences may be dare. There are rumours of education agencies being required of having immigration agency registration to operate. That would be highly disruptive and potentially deadly for hundreds of agencies. Furthermore, as the industry matures the competition increases and higher efficiency and professionalism will be required, an association of the agencies, by the agencies, for the agencies seem to be the best way to auto-regulate and protect everyone's interests, including students and education providers. We'll support any attempt to make the industry grow faster, healthier and more transparent, therefore it's logical for us to support ISEAA and try to make it successful as long as it's helping the education agencies of Australia. To learn more about ISEAA access their website: www.iseaa.org.au. Leave your opinion below, do you believe the government will impose regulations for education agencies that will be disruptive for the industry? What is your take on ISEAA? Are you planning to become a member?